Approximately 6 hours later, at 1pm ET, Kaspersky Lab reported more than 45,000 attacks in 74 countries. “Number still growing fast,” tweeted Costin Raiu, director of global research for the Moscow-based security firm. Update: There is a patch for this exploit—see the bottom of the post for instructions. Russia, Taiwan and Spain appear to be those initially hit the hardest, but a map of the infections generated by MalwareTech show the ransomware spreading to all populated continents, and numerous reports from security researchers indicate that WanaCrypt0r has also found its way into the US. 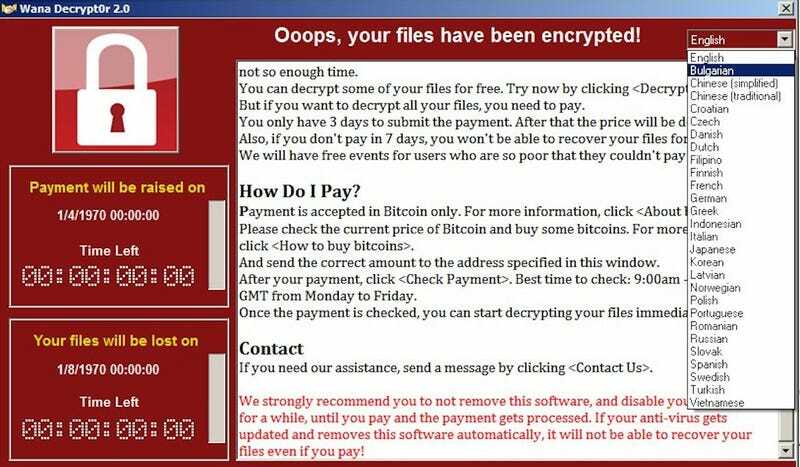 An initial report from UK-based MalwareTech researcher indicate that the ransomware was spreading peer-to-peer and may have been weaponized using a leaked Microsoft Windows exploit (EternalBlue) stolen from the U.S. National Security Agency. According to SwiftOnSecurity, after FedEx detected WannaCry infections at its UK offices, the company ordered its US partners to shut down all non-critical networked Windows-based systems. Update 5/12/17 3:04p EDT: Click here for information about the Windows versions or editions affected and for details on how to patch (MS17-010) the EternalBlue exploit. Or click here for instructions on how to review and install high-priorities updates on your Windows laptop or PC. This article will continue to be updated as new information comes in.